This is my little brother Teddy on his first birthday (dol). In Korea, the first birthday is celebrated as one of life’s most important milestones. Teddy is wearing the dol-bok, worn for the first birthday celebration. The stripes on his sleeves are in the traditional Korean pattern that incorporates the five “cardinal colors” of Yin and Yang. White represents metal, red represents fire, blue represents wood, black represents water, and yellow represents the earth. 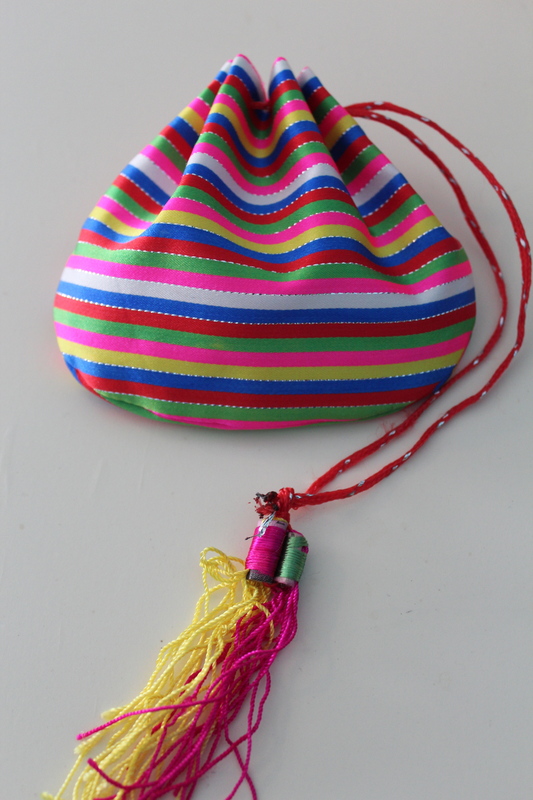 This colorful striped pattern is worn only by children and is meant to protect them from evil spirits. The long belt wrapped around his body represents longevity. A pouch like the one to the right, is strung on the belt for good luck. Traditionally, the gods Sanshin and Samshin Halmoni were honored at a first birthday celebration with offerings of food and prayer. Sanshin, the Shaman mountain spirit, (who has also been assimilated into Buddhism), grants prayers for sons. He is always depicted as an old man with a tiger by his side. Samshin Halmoni, or Birth Grandmother, is the Shaman spirit of childbirth. Symbolism imbues every aspect of the first birthday celebration. With a decorated screen as a backdrop, a round prayer table is set with an abundance of auspicious foods and objects. The roundness of the table ensures a smooth life without conflict and hardship. To cut a flower would be to cut short the life of a living thing, so only a potted orchid and artificial flowers (both seen on the left) decorate the table. Bronze tableware is used to represent a bright future. Noodles represent long life. The bowl of steamed white rice symbolizes wealth. The association is made explicit by the coins that are actually placed on the rice. Behind the bowl of rice are jujubes, which represent abundance, fertility, and prosperity. Other fruits are piled high in the display. The parsley to the right represents good health, longevity, fertility, and also marriage. Next to the parsley is a skein of thread for longevity, and coins for wealth. Usually one would find a bowl of seaweed soup, closely associated with birth and birthdays. An assortment of rice cakes is also usually present on the table. White rice cakes represent purity, rice cakes coated in red bean powder are meant to ward away misfortune, the multi-hued rice cake seen on the back right is meant to ensure that all of these good wishes for the child will come true. The child who chooses the bow and arrow will become a warrior. The medallion represents fame and prestige. Note the stethoscope and judge’s gavel on this doljabi table! and it was all foretold on his first birthday! owonderful • This entry was posted in Family, Korean Culture and tagged Birthday, dojabi, dol, Korea, Samshin Halmoni, Sanshin. Bookmark the permalink.